Rachel agrees to go with her boyfriend to meet his family in Singapore, not knowing the rich lifestyle and reputation they have there. An all Asian cast is a great move for diversity in film when we need it, to help make everyone feel represented on screen. 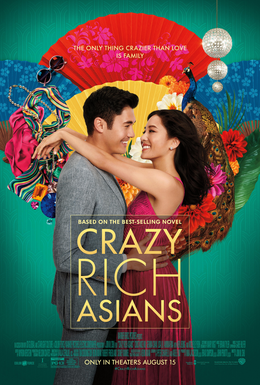 There’s some solid casting with an especially great turn from Michelle Yeoh, and the leads played by Constance Wu and Henry Golding are impressive as well. By having both Asian-American and Singaporean characters, the script has some interesting ideas about how different Asian cultures see each other and how their lives differ. Unfortunately, it’s not until the last act that the film realizes this, and the road there is a poorly directed and edited series of extended party scenes, unnecessary subplots, and an overabundance of pathetic supporting characters, especially an annoying role played by Awkwafina. Not much of the film focuses on the chemistry between these leads which is unfortuante because everything else is either repetitive (a 20-minute party scene dedicates most of its runtime simply to Rachel’s boyfriend introducing her to side characters that are useless and quickly forgotten about). Sometimes the dramatic moments feel unauthentic or too over-the-top to fit the rest of the film. The editing is all over the place and doesn’t know how to stay focused, and whenever the dialogue thinks it’s being funny, it’s actually insufferable. The movie compromises itself too much to please a wider audience simply looking for cool party aesthetics and happy moments instead of going for a profound journey for its main character. Just when the ending seems figured out, the ending feels like a cop out because the film is too afraid to take any risks. With the ideas this film had, it’s a pity the director made poor choices to focus less on the meaningful substance I’m sure they were aiming for. This is a step up for diversity in movies but not for mainstream comedy filmmaking. Keep in mind that the majority of audiences seemed to have loved this film, but I personally was not impressed by what I saw. If you want a film about what’s really important in the world today, I’d strongly recommend BlacKkKlansman.